This frilly edging was designed to finish off the lacy v-stitch baby blanket. You could use it on any baby blanket that needs a pretty lace edging. You can finish a striped blanket as in the original project with a coordinating lacy edge. Easy Baby Blanket Edging - Photo © Amy Solovay, Licensed to About.com, Inc.
For "busy," colorful baby blankets, use a simple edging that won't be overwhelming. This particular edging is worked in single crochet and slip stitches. If a lacy edge isn't appropriate for your design, it's a lovely simple edge to go with designs for boys or for girls. See the instructions included for the heart sampler baby afghan. This edging is just about the easiest one ever. 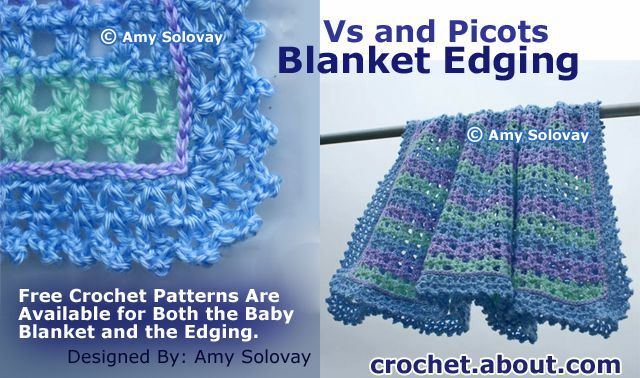 It's useful for finishing baby blankets or afghans for anyone in the family. Here you can see it used on the gingham check baby blanket, which can be a boy-friendly design. There are bunches of different ways you could style this pretty edging. It looks nice by itself, and it also looks beautiful if you add ribbons or other trims to it. This is such a pretty idea for finishing baby blankets or other types of projects. 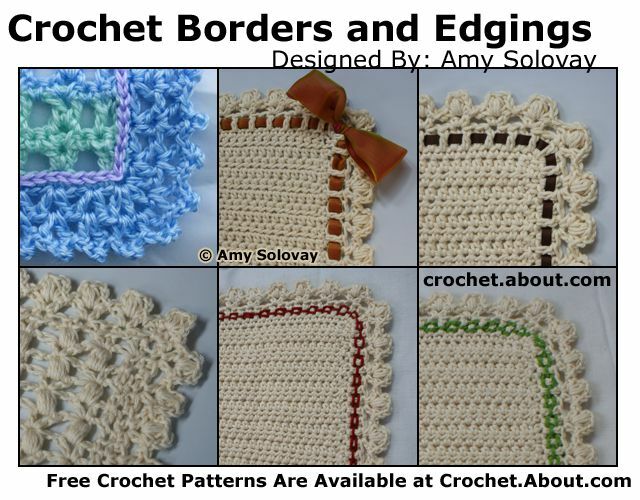 You could use it for crocheted placemats or just about any type of flat project that has four corners. See examples of adding ribbons or other trim to the puff lace edgings. This no muss, no fuss afghan edging is appropriate for baby boys or girls, although some color changes might be in order. The edging is made up of shell stitches that are built using half double crochet. The shell shape lends itself well to many projects. This edging is eye-catching but not too fancy. It features tall shell stitches built up with treble crochets in a two-color repeat. You can envision it in colors for baby boys or for baby girls. This edging is one possible way to finish off a baby blanket you can make using the customizable blanket pattern. The pattern includes instructions for many different sizes including a baby's receiving blanket size and a slightly larger crib size. You can also customize blankets for other family members too. This edging would also work well for finishing off some other types of baby blankets. I think this is a particularly boy-friendly design, although it could also be used for a girl's baby blanket.